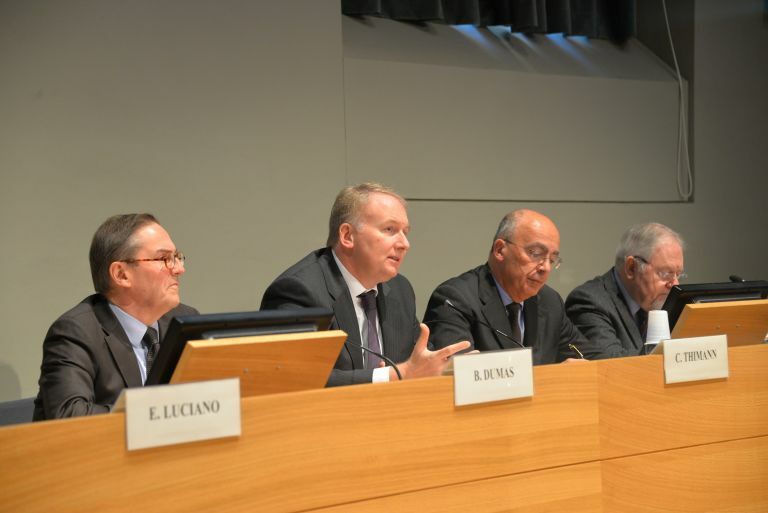 On December 6th, 2016 the University of Turin, in collaboration with Collegio Carlo Alberto, presented the new Chair about the socio-economic risks of the financial markets, headed by Prof. Bernard Dumas, and financed by AXA Research Fund, international initiative of scientific philanthropy of AXA Group. 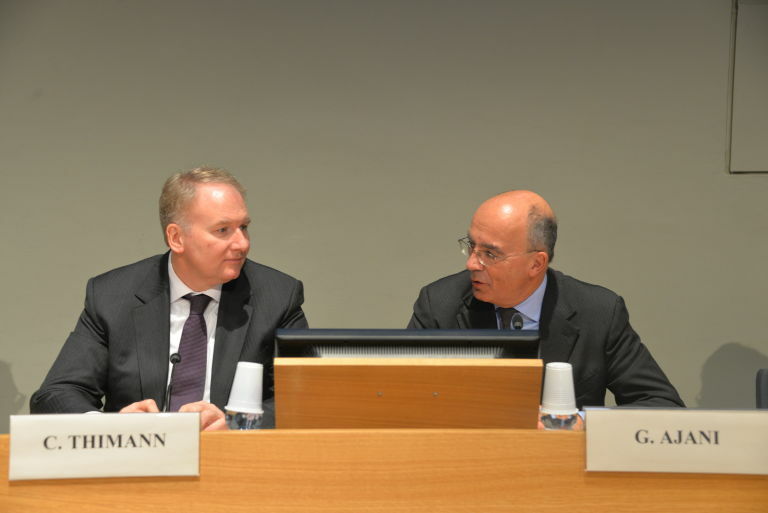 At the launch of the Chair, held at the Aula Magna Cavallerizza Reale, attended Gianmaria Ajani, Dean of the University of Turin, Pietro Terna, President of the Collegio Carlo Alberto, Christian Thimann, Group Head of Regulation, Sustainability and Insurance Foresight of AXA Group, Elisa Luciano, Professor of Finance at the University of Turin and fellow of the Collegio Carlo Alberto, Dario Focarelli, General Manager of ANIA and Carla Patrizia Ferrari, Chief Financial Officer of Compagnia di San Paolo. Prof. Bernard Dumas opened the work of the roundtable with an intervention on the volatility and the speed of Financial Markets. Too slow or too quick, is this the cause of individual actions? These reasons are unknown and fluctuating, they make it difficult to anticipate investor behavior, and make the prices on the stock market move more than it would be justifiable by economy movement and not reproduce faithfully its fundamentals. Created in 2007, the AXA Research Fund supports scientific research with a focus on understanding and preventing the risks threatening the environment, human life and society. The AXA Research Fund has so far supported 492 projects implemented in 33 countries by researchers of 51 different nationalities, investing 149 million euros. Italy and Italian researchers have received 13 million euros for about 40 research projects, including 3 Chairs. Funds are awarded on the basis of the Scientific Committee decisions. 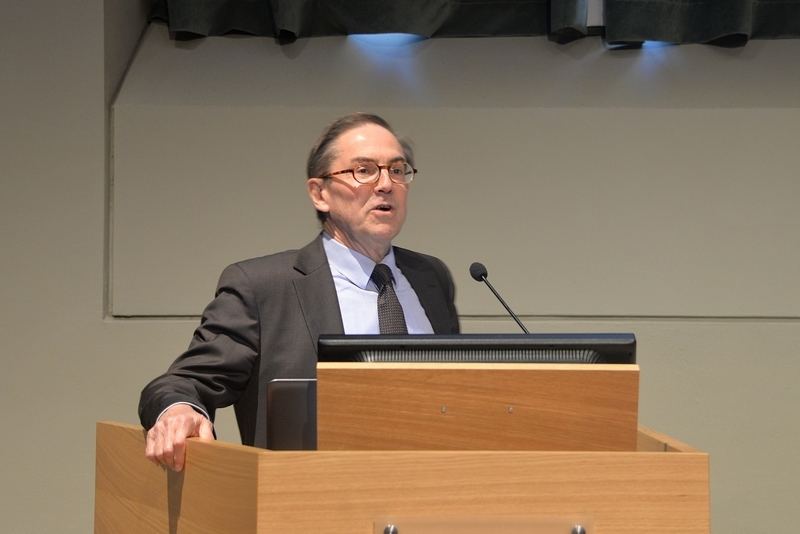 "We are very proud to support the AXA Chair of professor Dumas, whose innovative research approach and worldwide expertise have been recognized by the AXA Research Fund. We are confident that new models capturing the dynamic behaviors of investors should help strengthen our capacity to face risks related to financial markets, and reach a more desirable equilibrium" commented Christian Thimann, Group Head of Regulation, Sustainability and Insurance Foresight of AXA Group. "We are proud to have received the financing of the Chair from AXA - said Elisa Luciano, professor of Finance at the University of Turin and fellow of Collegio Carlo Alberto. This is a recognition of the professionalism and potential of the University of Turin in finance research and education. We expect it to imprint further potential and give international visibility to our researchers. It is a tangible example of important collaboration between public and private sector, with the aim of expanding scientific knowledge, but also to raise awareness among students on the importance of such partnerships, to gain a strategic vision of the economy and its trends". The University of Turin, after participating in a highly competitive call, has received a funding of 800,000 Euros to activate a Research Chair for a period of 10 years. In addition, with Collegio Carlo Alberto, partner of the initiative, the University will support the project with a 10,000 euro co-financing per year for activities related to the research program, which covers the attitudes, sometimes irrational, of individuals in markets, and the risks that these produce for other investors. According to Prof. Dumas this is one of the neglected elements of the analysis, that instead are better to be investigated to give new tools to the " economist’s toolbox ". The aim is to make available to all, especially to regulators, a more complete picture of the financial markets, to mitigate the risk of this volatility and achieve a better balance. Prof. Dumas has been identified, already in the planning stage, as Chair holder of the Chair for the first 5 years. Under the rules of the program, the University of Turin will launch an international call to select another chair holder, with similar characteristics of high reputation and proven international excellence, that will pursue the initiated research program.